I want to change my spring on my Krytac SPR, I believe it comes with a fairly low m90? Now someone on here recently said they replaced their Krytac CRB (I'm assuming the internals including the springs are exactly the same?) with a m100 and averaged just under 350fps. 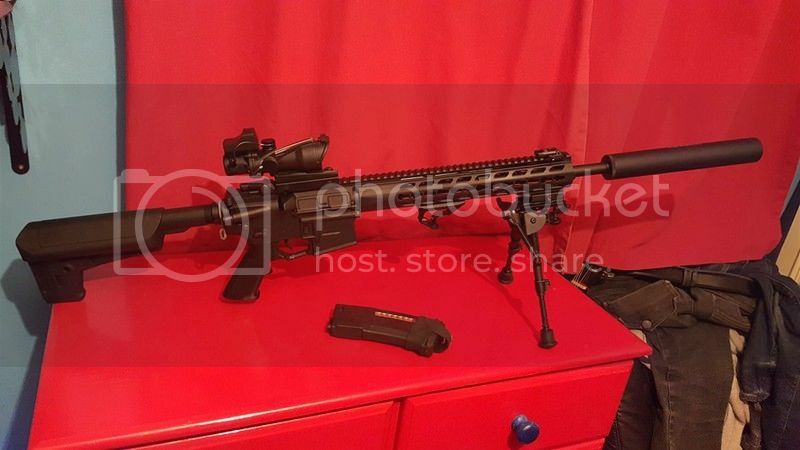 I had a look at general guides, would a m110 be around 380fps? A m120 around 410 etc? Also, as the spring goes up in power, does it get to a point where it could damage the gun or is it as simple as just swapping them out? Been looking on Patrol Base and for example, they have a MadBull M110 (Non linear???) and an ASG M110, same price, any difference between manufacturers when it comes to springs? What FPS are you trying to reach? This then equates to a variation of 10mm spring compression before the piston retracts - that is 3 x 3mm teeth of extra/less compression !!! Recce, it may have been me. I replaced the spring of my LVOA with an M100 (its a Lonex ). Raised the FPS from 310 to 340. Hasn't had any noticeable effect on ROF. I understand that internally the LVOA is the same as an SPR so imagine you should get the same result. Unless your DMRing your SPR and getting it locked to semi, I wouldn't get anything above an M100. You could end up with your gun firing too hot to field. Hi, I have an SPR and I put an m100 in. It came just to 360 fps with each shot on .20's, which is too hot. To solve this you can shorten the spring. I haven't done this because I don't trust myself yet and I don't have the proper tools and I do not wan't to half-a-job-bob it. I put the stock spring back in and to be honest it's fine. It still has the range and consistency and out range's most rifles anyways. Cheers for the replies guys, I meant to mention I am looking to DMR my SPR, so was looking to hit atleast 360 - 400 fps. Thanks Sitting Duck for all that info, very helpful mate. I'm currently about to buy some things from Patrol Base, do you recommend MadBull or ASG springs? If I were to buy a M110 spring is it literally as simple as replacing the old one? Plug and play kinda thing? Will a strong spring potentially damage anything?